The Pac-12 snagged three NCAA Tournament bids, but now comes the challenge: Can the conference get any wins? 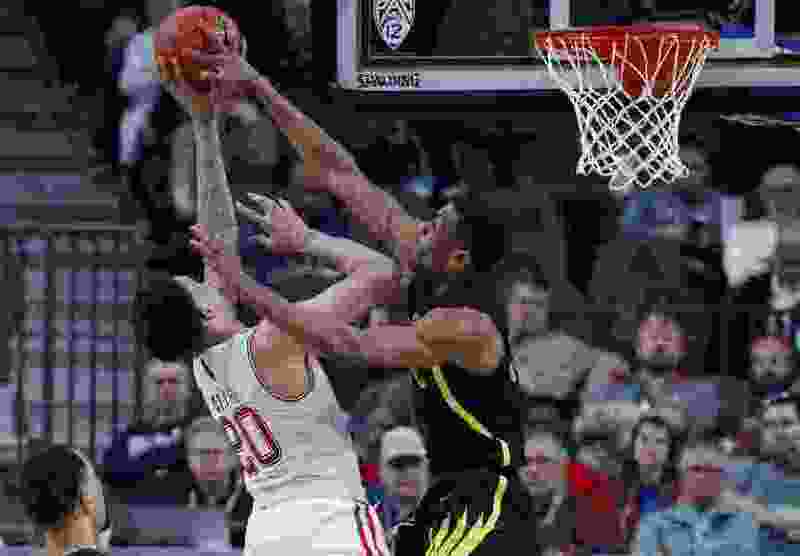 (AP Photo/John Locher) Oregon's Francis Okoro, right, tries to block a shot by Utah's Timmy Allen during the second half of an NCAA college basketball game in the quarterfinals of the Pac-12 men's tournament Thursday, March 14, 2019, in Las Vegas. The Pac-12′s goal in the 2019 NCAA Tournament is modest: win a game. Even a First Four victory for Arizona State would represent an upgrade in the conference's performance over last year, when ASU and UCLA were eliminated in Dayton, Ohio, and No. 4 seed Arizona was routed by Buffalo in the first round. The Pac-12 didn't make the round of 32 for the first time since 1986, and that showing followed the conference's 1-8 record in football bowl games. The league went 3-4 in bowls this past season and received nothing higher than a No. 9 seed in the NCAA Tournament. Even so, having three teams in this week’s field is a bigger achievement than seemed likely as of a month ago. Thank you, Oregon. The Ducks’ surge to the Pac-12 tournament title with four wins in four late-night games in Las Vegas may help reduce the conference’s level of embarrassment in the flagship sports lately. That will be especially true if Oregon can stage an upset as a No. 12 seed, or if No. 9 Washington can beat Utah State. No. 11 Arizona State vs. No. 11 St. John's, 7:10 p.m. Wednesday. No. 12 Oregon vs. No. 5 Wisconsin, 2:30 p.m. Friday. No. 9 Washington vs. No. 8 Utah State, 4:50 p.m. Friday. * - if ASU advances from the First Four. History supports him. The Pac-12 had only two NCAA teams in 2012, with Nos. 11 and 12 seeds. The conference recovered with five, six, four, seven and four bids over the next five seasons, prior to another downturn last year. But if the Pac-12′s NCAA runs ends Friday, the perception of a downtrodden conference will be tough to overcome — regardless of its power in women’s basketball and Olympic sports. ASU is a wild card, with its explosive offense and inconsistent defense. If the Sun Devils get past St. John’s in Dayton, they would face Buffalo — the team that knocked off their rivals last March. FiveThirtyEight analytics give Oregon and Washington about a 50-50 chance of winning a first-round game. Oregon has come to life with eight straight wins, including a Pac-12 quarterfinal victory over Utah. The way the Ducks are playing, they’re capable of reaching the Sweet 16. Oregon has made Washington look vulnerable lately, and the Huskies also lost to California and needed overtime to beat Oregon State in the late stages of the regular season. Washington’s matchup with Utah State will be fascinating. Utah averaged 78.2 points in Pac-12 play, yet scored only 53 and 45 points against the Huskies’ zone defense. That scheme will create a great test for USU guard Sam Merrill and the Aggie offense. "It feels like you got invited to a party" 🥳@UW_MBB @Coach_Hopkins describes March Madness feeling. The other issue is whether Washington can generate enough offense, after scoring only 22 points in the second half against Oregon. The Huskies have the conference’s Coach of the Year, Player of the Year (Jaylen Nowell) and Defensive Player of the Year (Matisse Thybulle). USU features the Mountain West Coach of the Year (Craig Smith), Player of the Year (Merrill) and Defensive Player of the Year (Neemias Queta). If the conference champions can beat the Aggies, the Pac-12 will have salvaged something from this basketball season. In October, who would have written that sentence?